The Christmas season is here and although I start early, I was a little slower dusting off the tree and trimmings this year. As I have been decorating our living room for the season, I am realizing that I am not as into the lavish and extravagant displays of holiday decor – A return to Simplicity is the theme of the season, but don’t mistake that for plain. There is something so exquisite about simplicity when you have just the right touches of decor. I get to enjoy each piece a little more. And I can get creative stretching my decor year round to get the most value for my money. I love a good bargain, so I’ve put a list together of quick ways to plus up your home this season while stretching your budget. I am also sharing a few of my favorites from my recent shopping trip to Dollar General. You don’t need to be super crafty though with these ideas, because Dollar General has recently expanded their collection to include home decor, bath linens and decorations, as well as a variety of useful kitchen wares including Pyrex and Black and Decker! Creating a cozy home is always the goal. Nothing says cozy like a warm throw and some pillows. I love using soft neutrals because it works with any color palette and can stay hanging out on your sofa long after the Christmas season. For pillows, I like to mix in no more than 1 seasonal pillow with a few year round favorites. Then you don’t have to worry about storing a bunch of pillows you can only use for 2 months. I scored this super fuzzy soft throw for $16 at Dollar General. Dollar General has many items like pillows and blankets that can also be incorporated into your Christmas decor. Every time I bring home a fuzzy blanket, it somehow ends up my son’s new favorite blanket for snuggling and watching television. Which, yeah, I totally get that. So snuggly! There is just something about a house that smells like the holidays, especially Christmas. As you probably know, I keep a collection of white candles of all sizes and incorporate them around the house. To change it up for the season, I sprinkle in a few smell-good candles that give all the vibes. Plus, they are easy to scatter on mantles, shelves, and tables for a sophisticated look. I like to incorporate a couple of small Christmas specific decorations for a hint of the holidays. No need to buy every cute thing in the aisle, but a few special touches can really pop. One of my favorite ways to decorate is actually with wrapped presents themselves. I often use them in unexpected places to add touches around the room until I gift them. 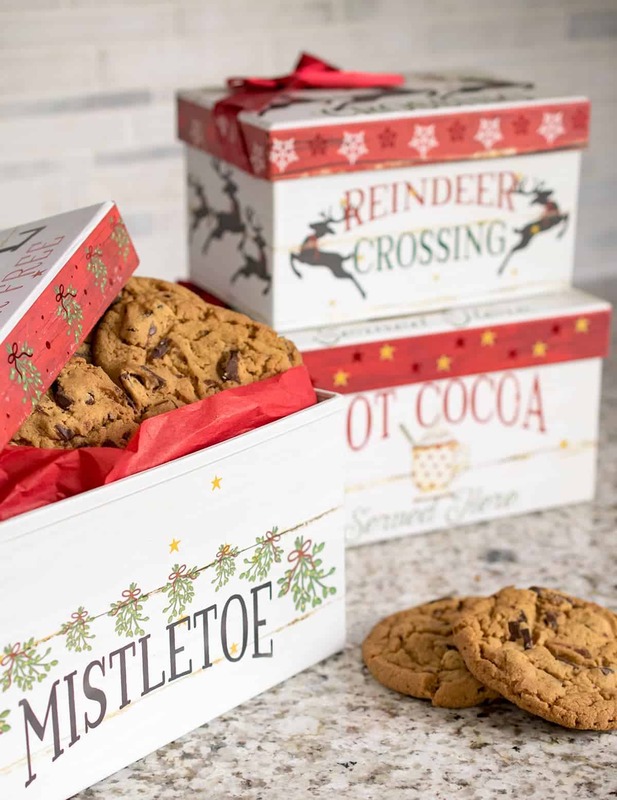 I got some small nesting boxes (3 for $4.50) with Christmas patterns on them that were perfect to fill with Holiday cookies for friends and neighbors. If you line them with some pretty wax or tissue paper they look fabulous and make great presents. You can also stack them for a small decoration. 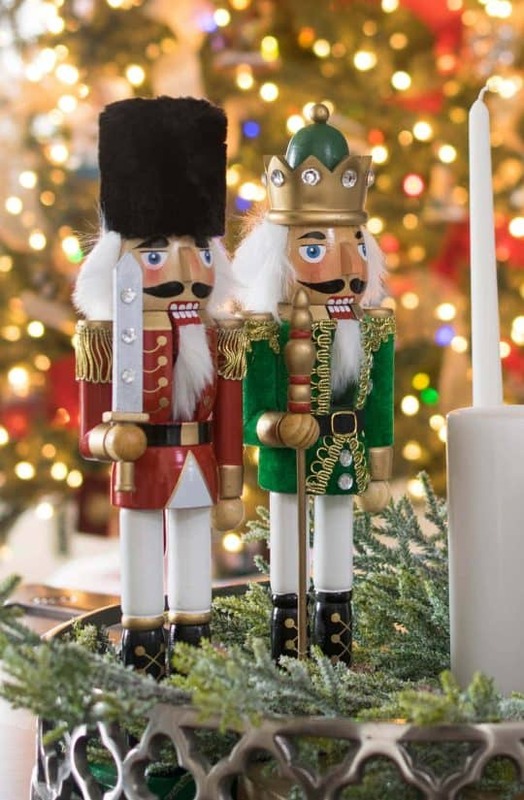 These nutcrackers are my favorite find this season! At $8 each, they are a steal and it allows me to indulge my Christmas decorating habit without breaking the bank! 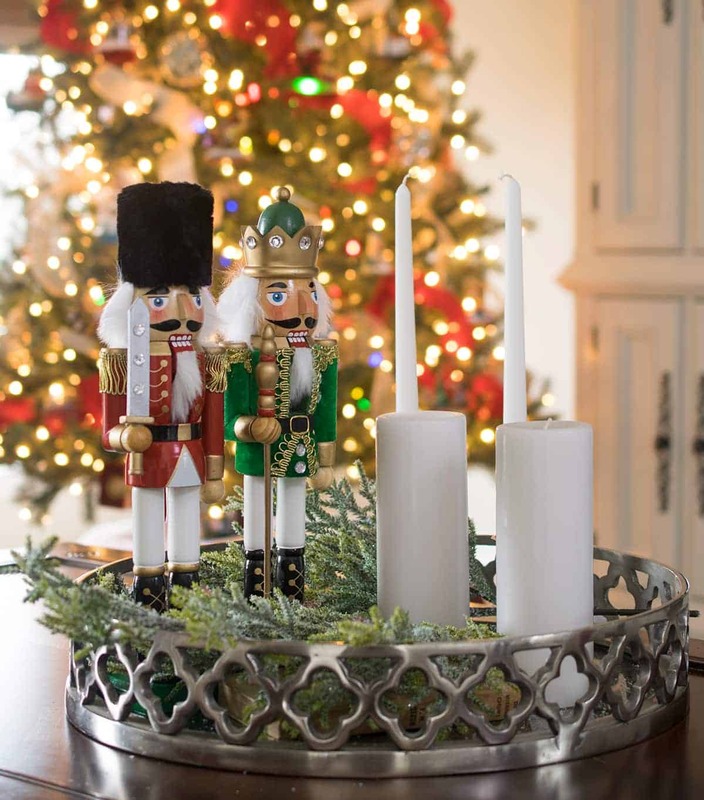 You probably know by now that I love Dollar General for fun crafting time with the kids, but they have beautiful holiday items like these at a price that can’t be beat. Pine trees, boxwoods, branches, and holly are usually easy to find if you have a yard. It’s great because they are free and last longer than store bought because they are fresher. I am known to put clippings in a vase for a soft arrangement or to even fluff up worn out garland with clippings from the yard. And a small setup of logs exudes cozy, even if you don’t have a wood burning fireplace. I have been saying all season that Christmas lights are the best background for everything. And there are so many more ways to use lights and ornaments than just on the Christmas tree. Put some ornaments in a bowl on the coffee table for bargain decor. Or tuck them into greenery around the house and on the mantle. I have even made ornament topiaries and tucked them into lanterns that I use year round. I know I will be so thankful for keeping the decor simple and fun this year, especially when the new year rolls around and it is time to store it until next year. If you love inspiration as much as I do, Dollar General provides beautiful home décor inspiration this season on its Explore More DG Home Goods page and Pinterest page. Check it out for more affordable ideas! Hey Rachel, those are great some recommendations! Love them all. The Christmas ornaments and lights are especially adorable. Have Holiday! Thank you and Happy Holidays! I love this time of year.